Home > San Francisco Travel Tips > Emperor Norton: The Historic Ruler of S.F. Emperor Norton: The Historic Ruler of S.F. San Francisco is full of colorful characters. And 200 years ago, there may have even been more wacky and wonderful people. So much so, in fact, maybe the modern-day eccentrics could take a lesson from the originals. And who was the first oddball of the city? Chances are it was a man named Emperor Norton. Starting as an entrepreneur during the Gold Rush and losing everything, Joshua Abraham Norton fled San Francisco in embarrassment. But instead of wallowing in his defeat, he returned to San Francisco a few years later, unhappy with the current shape of the United States, to declare himself “Emperor of These United States” and later adding to his title “Protector of Mexico,” wearing a civil war uniform customized to his liking. In other words, after he lost all his money, he went a little crazy. At first strange to most people, Emperor Norton gradually won over the public and became a local celebrity. His power was he truly believed he was Emperor. And once the city’s residents supported him too, with the help from the local newspaper for publicity, Norton I was able to dine in restaurants, cruise on public transportation and attend theatres in San Francisco, all for free. The businesses picked up the tabs to support Norton and his quest, but in reality they wanted a piece of the publicity too. Over time, Norton even chose to collect taxes from these businesses. Fifty cents here, another dollar there — in reality it was so he could support himself (Norton lived in a small flat near the Financial District with not much money) — but because he believed his role of Emperor so vividly, the businesses were happy to oblige. Upon his death, Emperor Norton created a following much larger than any person of the era. So large in fact, he still holds the record for the most popular San Francisco funeral in history, with more than 30,000 people lining the streets to pay respect. Not bad for someone with no political power. Or so we thought. 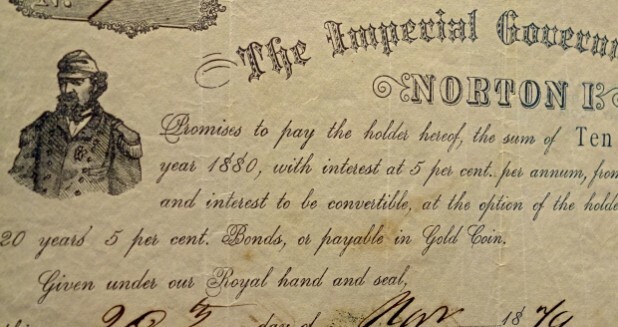 Emperor Norton lived in San Francisco from 1859 to 1880, and a copy of his actual currency, which he used as a means of barter, can be found in the Wells Fargo History Museum on Montgomery Street. He’s a local legend of the city. San Francisco—Where Do I Start? Top Free Museums in S.F. Best Late-night Food Spots in S.F. 6 Best Views in S.F. Why is Coachella So Expensive?